After a very wet and mild start to the summer, the sunshine has finally put in an appearance! Hooray! A sudden burst of vitamin D and everyone seems to be in a better mood. It can be hard work for our furry four legged friends though. They don’t always have the sense to take it easy or find some shade, so sometimes they need some encouragement to stay cool. To help ours keep cool and hydrated we came up with the ‘Marmite Lolly’. I know it sounds a bit yuk, but trust me, they love them. 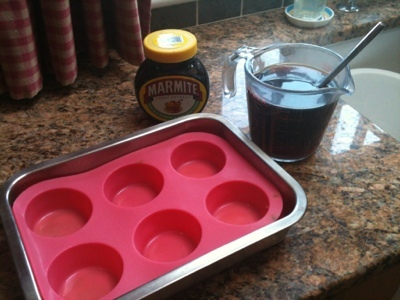 Add 1 dessert spoon of marmite to 750 ml boiling water and stir until disolved. Now pour into moulds to suit the size of your dog. 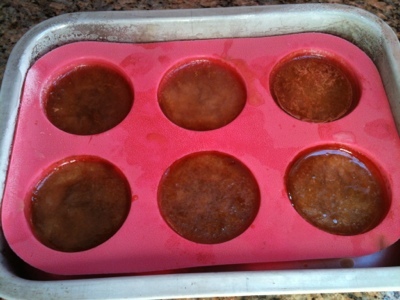 ( I use a silicone muffin tray as my dogs are on the larger size, but you could use ice cube trays or lolly moulds). I then pop a treat in the middle of each and put them in the freezer until frozen. 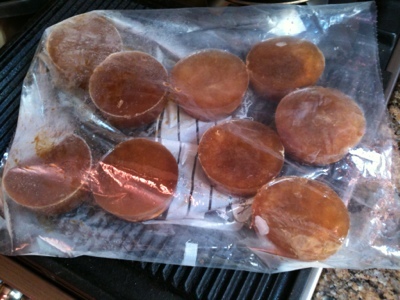 When they are completely frozen, you can remove them from the moulds and store in a freezer bag. 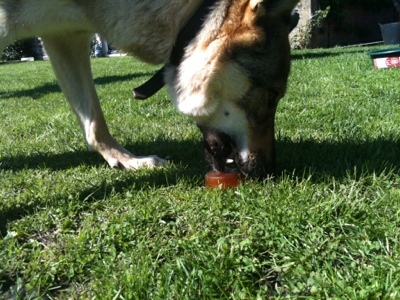 They make great treats for hot dogs on hot days! It must be a British thing! 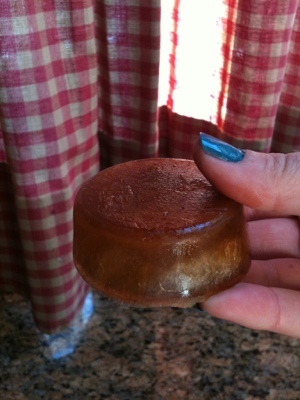 Delicious on hot buttered toast if there is any left after making dog treats! I don’t believe i’ve ever seen marmite in our local grocery stores here! It is such a good (an relatively inexpensive to boot) treat idea! Our Luna loves ice cubes in general. We freeze chicken broth and she goes haywire for them. Back during her teething stage we would put peanut butter in a cow hoof and freeze it, so it would take her a while to get the reward of the peanut butter and the cold texture would be soothing for her teeth. We have also been giving them frozen carrots and bananas. Anything to keep them cool! It looks like our one week of British summer is over now though! I thought Florida was bad, but here is South Carolina it’s gotten to 107 degrees! Too hot for the pooches to be outside without their little doggie pool and hydration. Thanks for your comment on Doggerel! Tuchena is SO beautiful. I look forward to reading more about her! 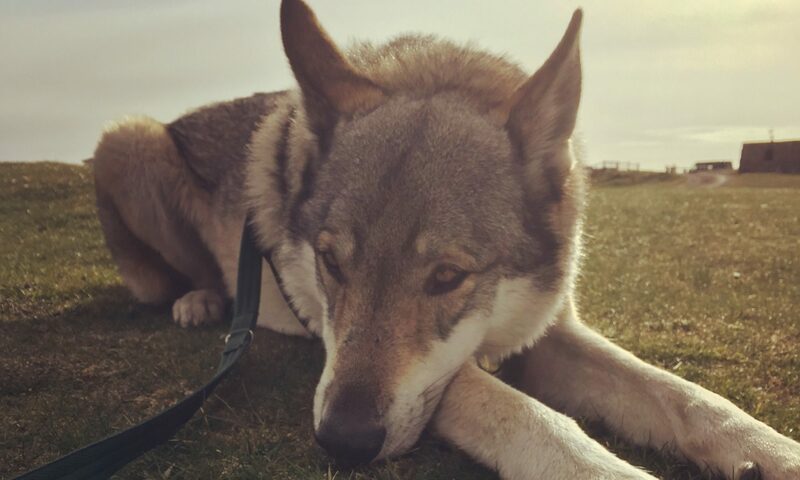 Next PostNext So, what is a Czech Wolf Dog really like?